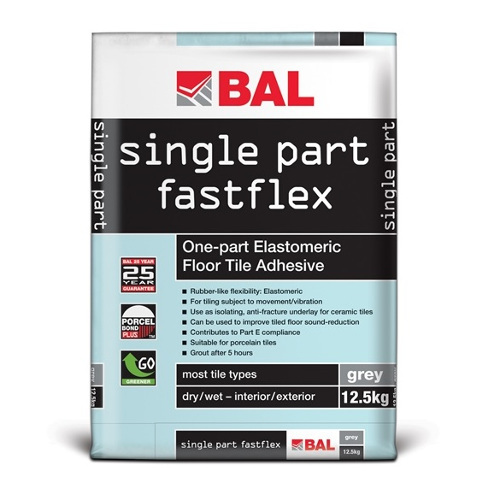 BAL Single Part Fastflex is a sound-deadening floor tile adhesive that can also be utilised as isolating, anti-fracture underlay for ceramic tiles. Recommended for areas subject to limited movement and vibration, BAL Single Part Fastflex is water/frost resistant and is suitable for fixing ceramics, ..
Cellecta DECkfon Screedboard Adhesive is a high strength acoustic adhesive specifically designed for bonding Screedboard 28.CHARACTERISTICSHigh strength adhesiveEasy to applyNo screws requiredCoverage: approximately 33m2 and is used in the interlocking detail ..
Ceresit CT 240 Winter is a high quality accelerating additive for wet renders and paints drying under low temperatures in late autumn and early spring times, especially when the temperature fall below zero in the nights. 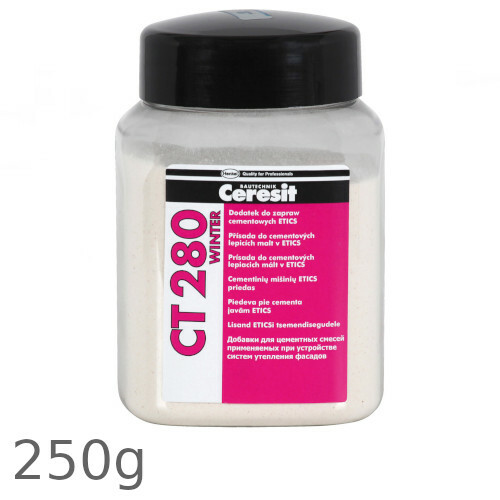 This additive can be used for thin-coat acrylic renders - CT 60,..
Ceresit CT 280 Winter is a high quality accelerating additive for ETICS and wet renders drying under low temperatures in late autumn and early spring times, especially when the temperature fall below zero in the nights. 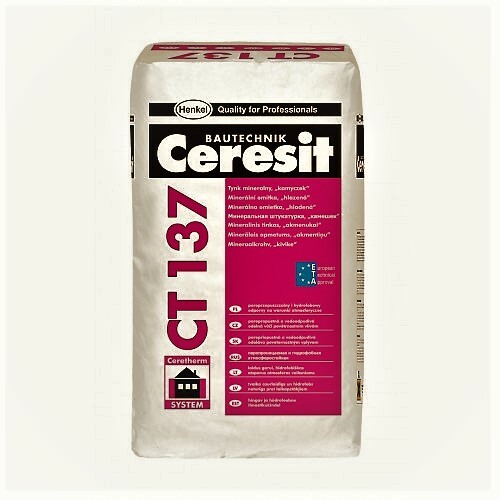 This additive can be used for cement based mineral adhesive morta..
Ceresit CT137 is used for making thin layer plasters on concrete substrates, traditional plasters, gypsum substrates and gypsum cardboards, gypsum-fibre boards, etc. 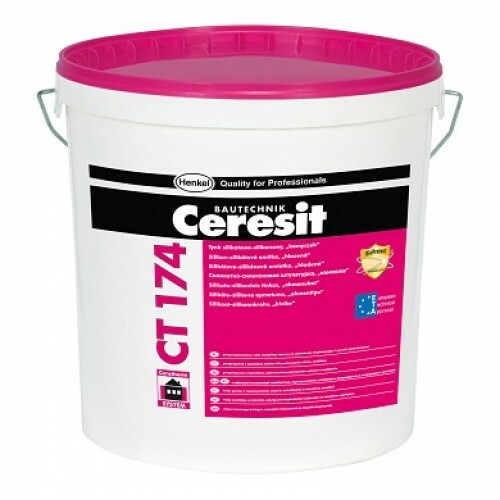 We recommend the application of the plaster CT137 as faade plaster within Ceresit ETICS (External Thermal Insulation Composite Systems..
1.5mm grain Ceresit CT174 Silicate-Silicone Render is a decorative thin-layer render for indoor and outdoor applications. 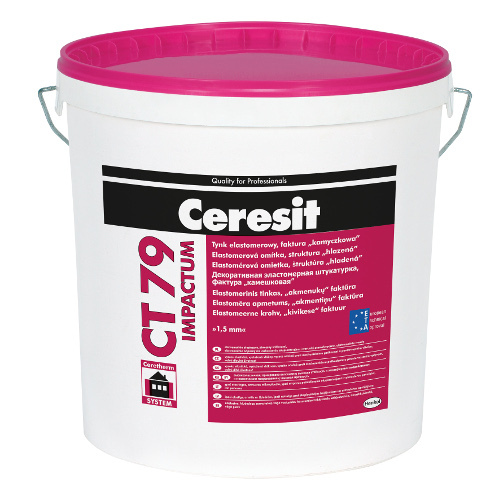 Ceresit CT 174 combines good points of silicate render and silicone render. It is vapour permeable, of low absorbability and dirt resistant. 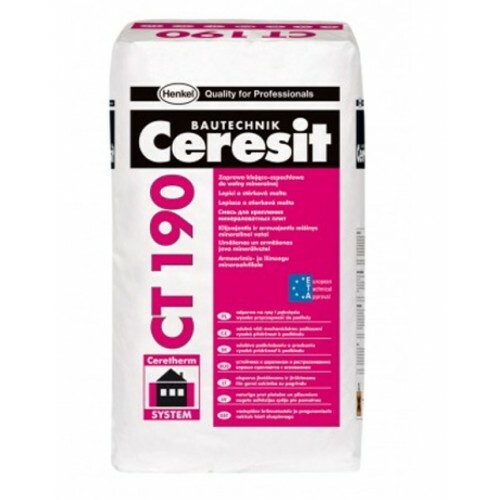 It is used for making thin-layer rend..
Ceresit CT 190 mortar is designed to warm up external walls of the buildings by application of external thermal insulation composite system using mineral wool faade boards. It is an element within Ceresit Wool Classic insulation system. 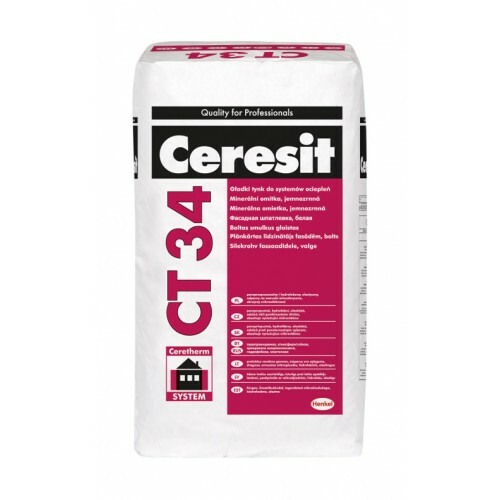 Ceresit CT 190 mortar is used for fixing of mineral wool faade ..
Ceresit CT 34 Smooth Mineral Render is used for plastering external surfaces and also as a mineral filler for smooth surfaces. 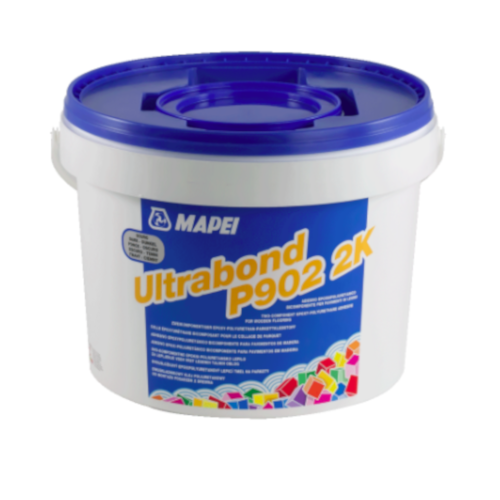 It is also used to repairing traditional and cement-lime plasters of external and internal surfaces of buildings. It may be applied to fill deep losses e.g. 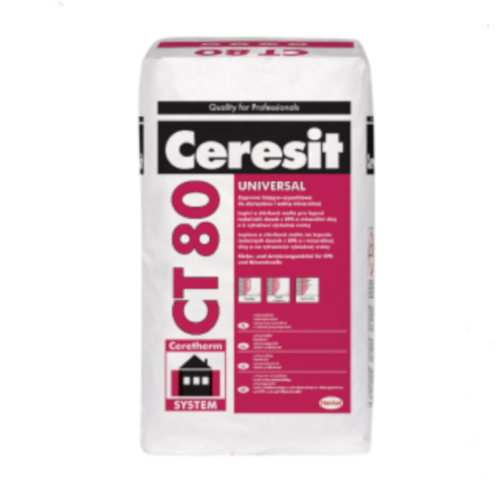 chases after ins..
Ceresit CT60 is used for making thin-layer renders in External Wall Insulation Systems, on concrete substrates, on traditional renders, gypsum substrates and chipboards, gypsum cardboards, etc. 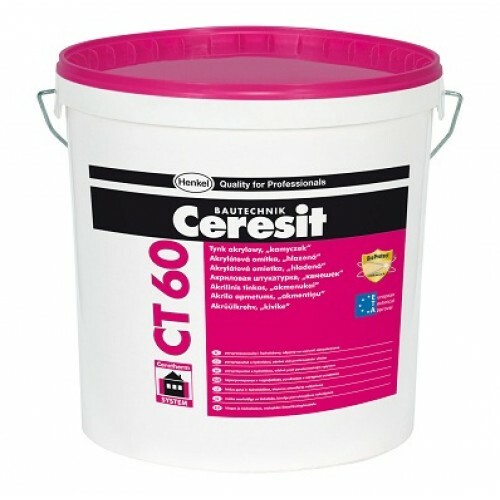 We recommend the application of the render CT 60 as facade render within Ceresit ETICS (Ext..
1.5mm grain Ceresit CT 72 Silicate Render is used for making thin-layer plasters on concrete substrates, traditional plasters, gypsum substrates and chipboards, gypsum cardboards, etc. 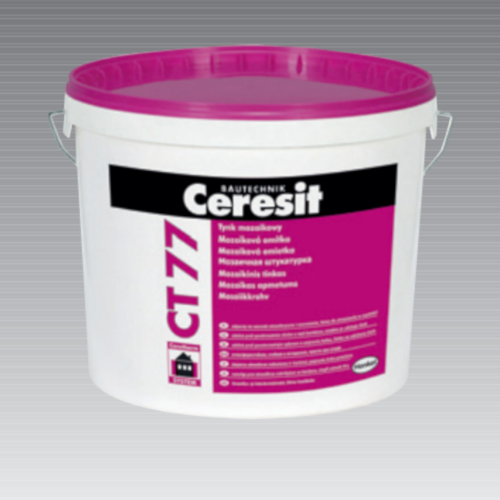 We recommend the application of the plaster CT 72 as faade plaster within Ceresit ETICS (External Thermal Insulatio..
1.5mm grain Ceresit CT74 is used for making thin-layer renders on concrete substrates, traditional renders, gypsum substrates and chipboards, gypsum cardboards, etc. 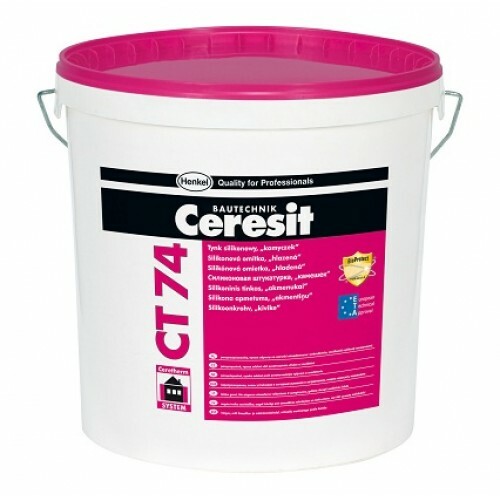 We recommend the application of the render CT 74 as faade render within Ceresit ETICS (External Thermal Insulation Composite Systems) ..
1.2mm - 1.8mm grain Ceresit CT 77 Mosaic Render is used for applying decorative colourful plasters to traditional plasters, concrete substrates, gypsum substrates and chipboards, gypsum cardboards, etc. Transparent resins are the binder and coloured quartz gravels size of 1.2 mm - 1.8 mm and natural..
1.5mm grain Ceresit CT79 Impactum is a tough stone like decorative elastomeric render for indoor and outdoor applications, where high damage and operating resistance is required. 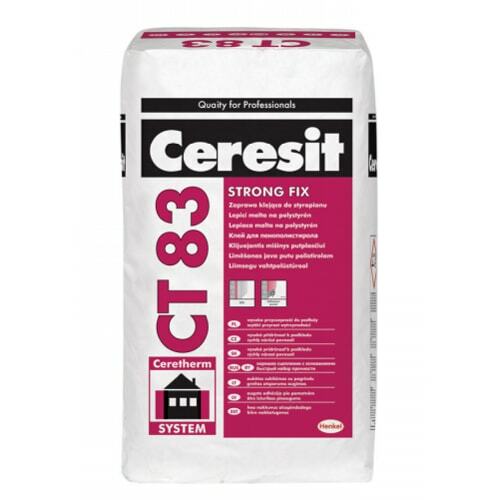 This render is specially recommended for applications on partitions where high damage and operating resistance is require..
Ceresit CT83 Strong Fix Adhesive Mortar is specially created or fixing EPS and XPS boards for external thermal insulation of buildings. It can be used within Ceresit ETICS (External Thermal Insulation Composite Systems) with a light-wet method. 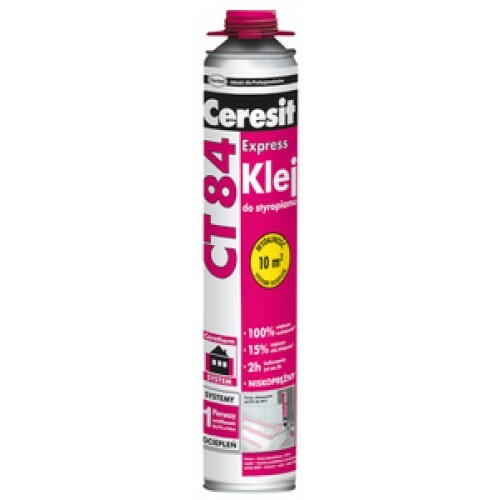 Ceresit CT83 mortar can be used on newly erected buildi..
Ceresit CT84 Express is a one-component low expansion polyurethane adhesive for fixing an External Wall Insulation boards (Phenolic, PIR, Expanded Polystyrene) and also plasterboards in drylining. Approximately 2 hours after application, the insulation boards may be smoothed, anchored and, then the ..
Ceresit CT87 mortar is designed to insulate external walls of the buildings by application of external thermal insulation composite system using EPS- or mineral wool facade boards. 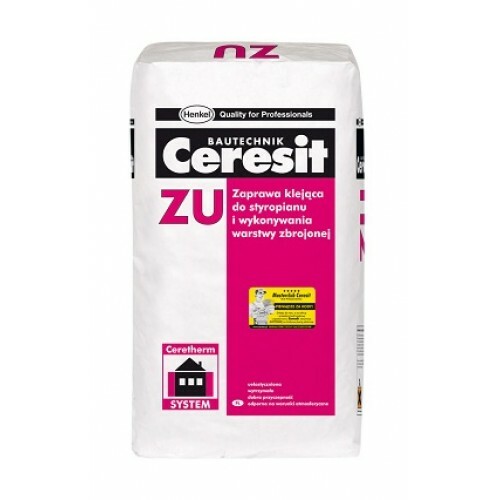 It is an element of following ETICS from Ceresit Ceretherm Premium, Express and Wool Premium. 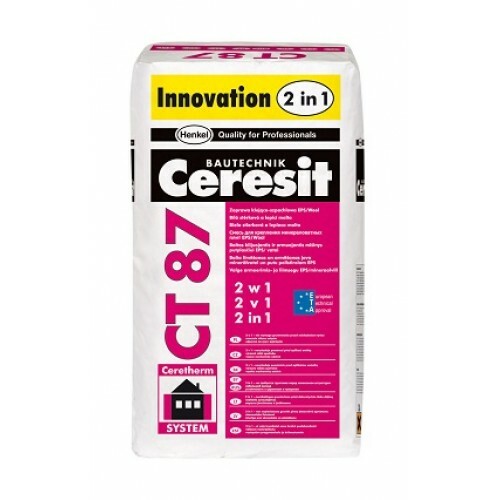 CT 87 mortar is..
Ceresit ZU is designed to insulate external walls of the buildings by application of external thermal insulation composite system using polystyrene boards. It is a component of following ETICS from Ceresit Ceretherm Premium, Express and Wool Premium. 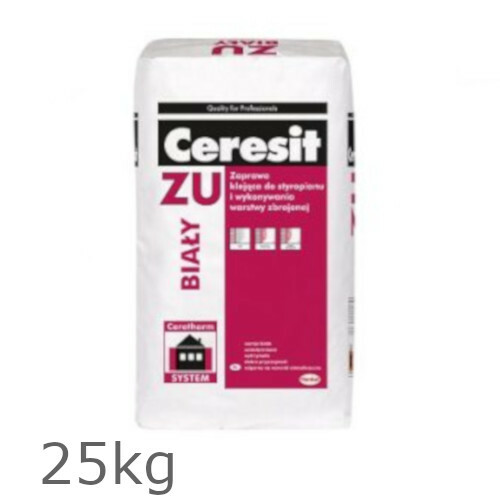 Ceresit ZU is used ..
Ceresit ZU White is designed to insulate external walls of the buildings by application of external thermal insulation composite system using polystyrene boards. 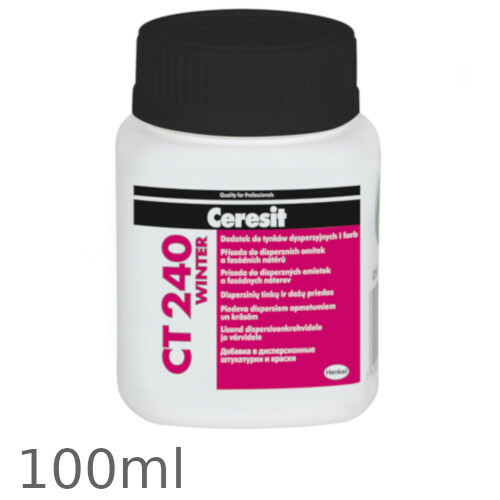 It is a component of following ETICS from Ceresit Ceretherm Premium. Ceresit ZU White is used for fixing of ..
Everbuild All Purpose Weatherproof Wood Adhesive is a medium viscosity, resin based polymer emulsion which exceeds the water resistance requirements of BS EN204 D3. 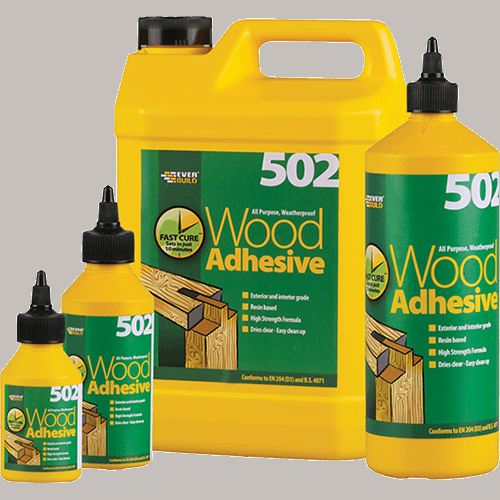 It is also suitable for load bearing work as it conforms fully to the BS 14256 Sustained Load requirements.CHARACTERISTICSExcellent rat..
Everbuild D4 Wood Adhesive (1L) is a solvent free industrial grade waterproof D4 wood adhesive based on the latest hybrid resin technology. 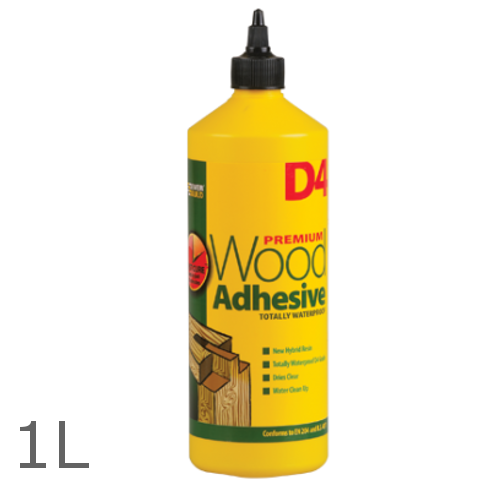 It can be used internally and externally and gives a high strength, water, impact and temperature resistant bond that is usually stronger than the wood itself. 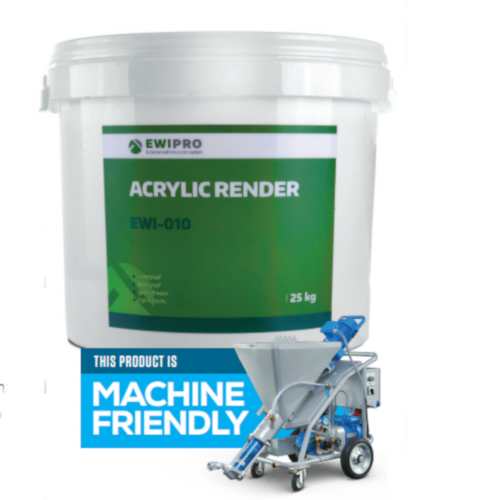 ..
EWI-010 Acrylic Render is a flexible, resistant to mechanical impact render with excellent water and frost resistance good at holding vibrant colours. It will form a long lasting, aesthetically-pleasing protective barrier on the external surface of your building. This Acrylic Render has excellent wa..
100ml EWI-020 Render Accelerator is used to reduce the drying time of Silicone Silicate, Silicone and Acrylic renders, and also accelerates the curing time of textured renders, enabling the faster completion of jobs.CHARACTERISTICSAccelerates the curing process, Faster job completion, Can..
EWI-040 Silicone Silicate Render is a very flexible, highly breathable and resistant to mechanical impact and UV rays silicone enhanced render that will form a long lasting, aesthetically-pleasing protective barrier on the external surface of your building. 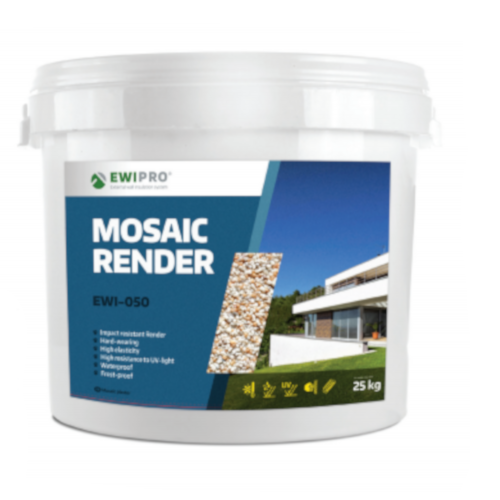 EWI-240 Silicone Silicate Render has excel..
EWI-050 Mosaic Render is a ready to use decorative render that can be used indoors or outdoors as a thin-layer render coat. 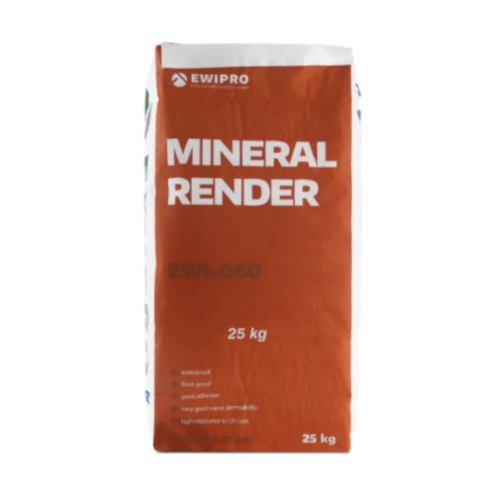 It is a highly durable render due to the quartz aggregate grain size of 1.8mm, held within a transparent acrylic resin binder that makes it ideal for exposed surfaces prone to ..
EWI-060 Mineral Render is a breathable and quick-drying, making it ideal for installation in colder, more humid conditions. It is based on Portland cement, texturing aggregate, mineral fillers and hydrated lime and is perfect for external plastering work. 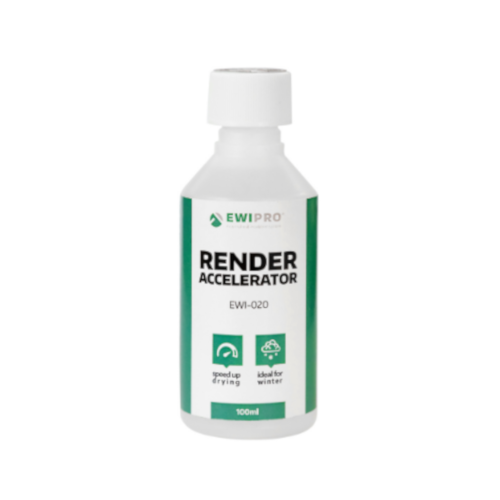 EWI-060 mineral render is highly breathable,..
EWI-075 Silicone Render is a very flexible, highly breathable and resistant to mechanical impact and UV rays silicone enhanced render that will form a long lasting, aesthetically-pleasing protective barrier on the external surface of your building. 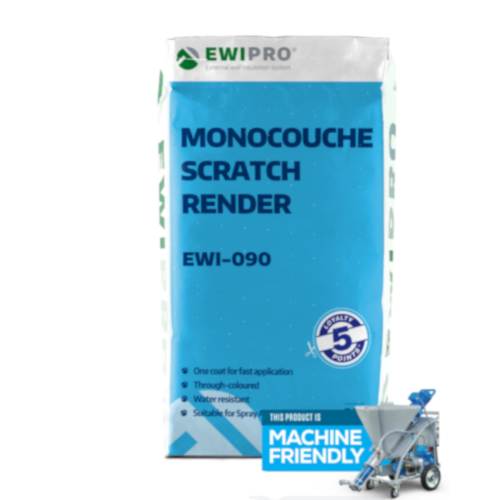 EWI-075 Silicone Render has excellent water and fro..
EWI-090 Monocouche Scratch Render is a one coat, polymer modified dry mix render, great for render-only system, and only requires the addition of water prior to application. EWI-090 is through-coloured and applied in two passes, where the fibreglass mesh is embedded within the first pass to provide ..
EWI-104 Universal Tile Adhesive is a long-lasting, waterproof, frost proof universal adhesive, perfect for fixing natural stone tiles, ceramic and clinker tiles to substrates. 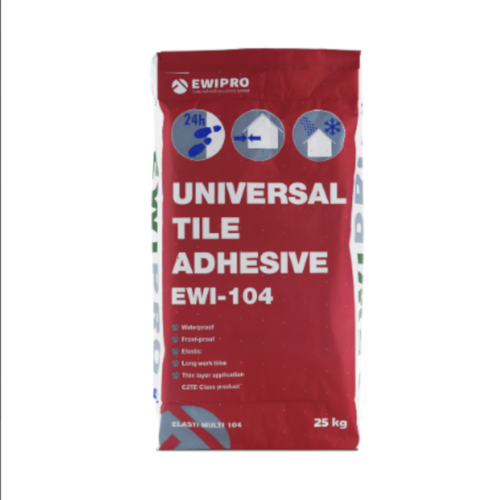 EWI-104 has a long correction time, allowing you to adjust tiles after application. 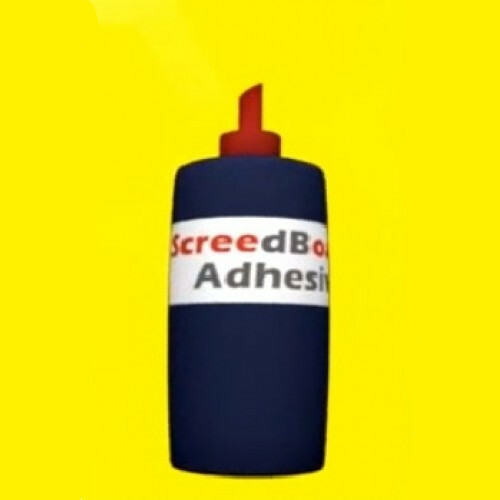 It can be used to fix tiles to walls or ..